There's an efficient LED bulb for every fixture and room, at every brightness, and in every color! Use this guide to learn about bulbs, and our app to find the right ones. Looking for the perfect LED bulb? There’s an app for that! The Right Light App helps you choose the right energy efficient LED bulb for you, from bulb and fixture types to color and brightness suggestions. Focus on Brightness. Different amounts of light are needed for different uses. Instead of thinking about light bulbs based solely on the amount of energy they use, focus on their brightness level. Lumen is the measurement of brightness. Higher lumen bulbs produce brighter light. Watt (W) is the measure of power consumption. Lower wattage bulbs can lower your electric bills. If you like your bulb’s current brightness, choose an LED with similar lumens to reduce your energy use. You may also consider a bulb that is less bright to save more. Note: Lumen output listed on packages may vary. Light bulbs listing anywhere from 800 to 860 lumens are similarly bright, for instance. Choose Light Appearance. You’ll be pleased with your new bulb by choosing a light appearance that you like. All of these colors are available for LEDs, and at most brightness levels. 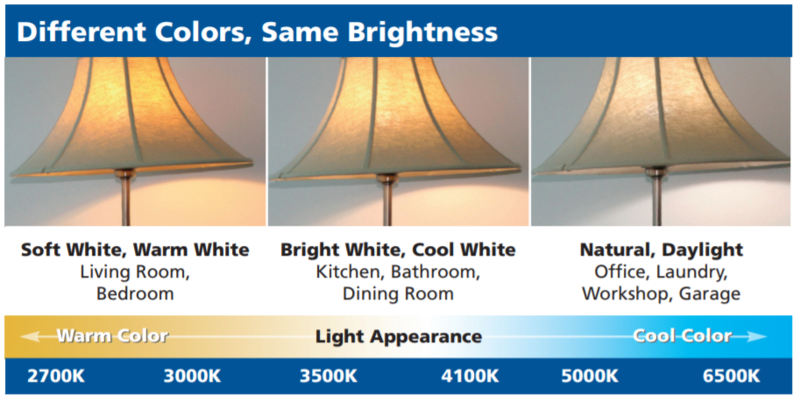 Note: Choose warm or soft white (2700-3000 K) to match the color of incandescent bulbs. Compare Types of Light Bulbs. You can think about product, replacement, and energy costs over 20 years for different bulb types. Why 20 years? Because LEDs can last that long. Many incandescent bulbs have been phased out, and CFLs are becoming less popular. The pros and cons below will help you pick a bulb that is right for you, and so will the Right Light App at the bottom. Note: Cost comparison is based on a 20-year life and takes into account power consumption, hours of use per day, residential electric cost, bulb cost, and replacement cost. Buying High-Quality Bulbs. The Lighting Facts label on all bulb packaging clearly shows light appearance and brightness. 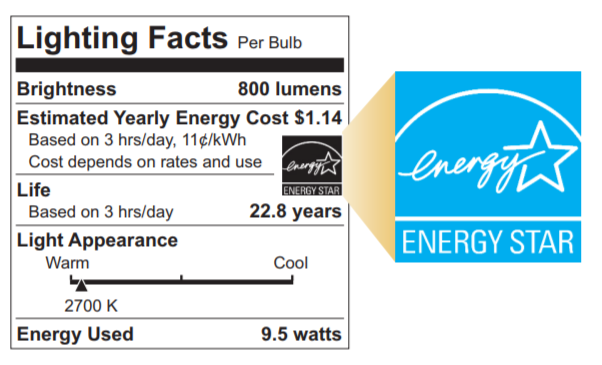 The label also includes the ENERGY STAR® logo when a bulb meets the required certification levels for high efficiency, performance, and reliability. There’s an app for that! The Right Light App helps you choose the right energy efficient LED bulb for you, from bulb and fixture types to color and brightness suggestions! Access the app from any device at http://rightlightapp.org. Get utility rebates. Contact your electric utility to learn about lighting rebates. What are the advantages of switching to LEDs? LEDs use much less electricity than other bulbs, have extremely long-rated lives, produce very little heat, do not emit UV or infrared, contain no mercury, are resistant to shock and vibration, and can operate effectively in extremely cold environments. How do I get a bulb to fit my fixture? Bring the bulb that you are replacing with you to the store to match the size to be sure that your new bulb will fit in the fixture when you get home. Also, some recessed fixtures have tabs that allow you to adjust how deeply the socket is set – be sure to turn power off to the lights before making any such adjustments. How could I prioritize upgrading my bulbs? If you want to buy more efficient bulbs over time to reduce the cost of buying a whole home’s bulbs at once, you can replace bulbs in high use areas first. If you leave porch lights on overnight, these bulbs could be upgraded to LED bulbs immediately – the savings could be significant if you’re using incandescent bulbs presently and they work better in the cold too! Next, look around your home to see which spaces you use the most, and therefore use the lights the most in those areas. Do you like to leave the light on over the kitchen sink most of the evening? Is the dining or living room a favorite hangout for the family in the evenings? Do you work from home and have a desk lamp or office light on much of a working day? If you said yes to any of these, then they would all be great places to changeout first. One of the last places to change are bulbs located where lights are used very few hours and turned on and off frequently (for example, closets). Do I need to recycle LEDs? No, but you can. LED light bulbs do not contain hazardous material and so these bulbs can be placed in the garbage. There are electronics in the base of an LED light bulb (a circuit board), and so you can recycle LED light bulbs at some locations. Use the CERTs Right Light Recycler to find locations near you. County hazardous waste drop-off sites as well as stores like Home Depot, Ace Hardware, Lowe’s, Batteries Plus. Use the CERTs Right Light Recycler to find locations near you. Why do LED light bulb packages say "equivalent"? Saying that a LED light bulb is a “60W equivalent”, for example, is the manufacturer’s way of most easily describing the brightness of the bulb in terms with which we might be familiar. Many folks can picture the brightness difference between a 60W incandescent and a 100W incandescent. So, the manufacturers are equating the LED bulb’s brightness to an incandescent bulb’s brightness using power (watts) instead of brightness (lumens). Someday, we might see packaging that says 800 lumens and 1600 lumens instead! How much do LEDs cost? Most are between $8 and $20. At Home Depot, Menards, Ace Hardware, Hardware Hank, Batteries Plus, and other locations in Xcel Energy service territory, prices on LED and CFL bulbs reflect the utility rebate, making them less expensive than elsewhere in the state. Find stores in Xcel Energy service territory at Xcel Energy’s website. Are LEDs and/or CFLs dimmable? Most LEDs are dimmable using most dimmers—be sure to check lighting packaging labels. Some CFLs are dimmable, but they must be labeled as dimmable bulbs. LEDs dim more fully (nearly the full range of 0-100%) and more smoothly than CFLs (even if the CFL is labeled as dimmable). If your dimmer switch is more than 30 years old and/or gets very hot, you should replace your switch, regardless of what style of bulb you use. Older or incompatible dimmer switches may cause flickering or a dim that is not very smooth dim. Upgrading to a new dimmer switch is easy and inexpensive. Choose a “universal” style and avoid dimmers that are for “incandescent-only.” You can also opt for a dimmer that is specifically for LED or CFLs, but this is not necessary. Also, pay attention to the maximum wattage specified for the new dimmer switch to be sure it is enough to accommodate the sum of current and future light bulb wattages on that switch. What makes dimming a dimmable LED/CFL bulb different than dimming an incandescent bulb? Dimmable LED/CFL bulbs contain electronic circuitry not present in incandescent bulbs. Therefore, it is difficult to achieve the same smooth start and complete dimming range as one sees with incandescent bulbs. “Universal dimmers” are designed to interact with the electronic circuitry, providing smooth low level dimming on the majority of bulbs by the major manufacturers. You can also look-up models and brands of dimming switches that are compatible with the brand of dimmable LED or CFLbulbs you have. Can I use an incandescent-ONLY dimmer switch on dimmable LED/CFL bulbs? A standard incandescent dimmer can be used to dim dimmable LED/CFL bulbs; however performance may vary. In some instances, it will work perfectly and in others you may experience issues such as flickering, reduced dimming range and fluttering. The “universal dimmers” are a better option because they are specifically designed to optimize performance when paired with dimmable LED and dimmable CFL bulbs. Or look-up models and brands of dimming switches that are compatible with the brand of dimmable LED or CFL bulbs you have. Can LEDs and/or CFLs work in 3-way fixtures? Only when labeled as such. A non-3-way CFL or LED bulb will work in a fixture with a 3-way switch, but only at the highest light output level. Can I use LEDs and/or CFLs in enclosed fixtures? All light bulbs will have their lives shortened by being in enclosed fixtures, including incandescent, CFL, and LEDs. LEDs being the bulbs that produce the least amount of waste heat are the best choice in enclosed fixtures, but be aware they may not last as long as they are rated. Many new LED bulbs specifically say on the packaging whether they are safe for enclosed fixtures. Early bulb failure is the only danger here, not safety. On the other hand especially incandescent and to a lesser extent CFLs used in a fully enclosed fixture can present a fire hazard as well as early failure. Many fixtures that seem to be fully enclosed are not actually fully enclosed – Inspect closely for ventilation holes often at the top. More detail: Most CFLs are A-line bulbs. These can be used in a variety of places, but Dept of Energy recommends using CFLs packaged as ellipsoidal reflectors (type-ER) in recessed fixtures. Use reflector (type-R) or parabolic reflector (type-PAR) CFLs for flood and spotlighting. Yes, LED bulbs work great outside. Unlike CFLs, which take a long time to come on in the cold and can be dimmer or bluish in color, LEDs come on instantly and create the same light level at any temperature. Do CFLs or LEDs cause fires? Do I heed the sticker inside light fixtures warning not to use bulbs greater than so many watts because of the risk of fire? These warning stickers are for incandescent bulbs only, and are designed to prevent overheating the light fixture, risking fire. LEDs and CFLs give off much less heat than incandescents, and therefore, the warning does not hold the same meaning for these more efficient and safer bulbs. Unfortunately, there isn’t an easy way to update all those old fixture labels, nor to give people accurate information about how much heat a fixture is actually rated to withstand. While a bulb purchased may say “60 Watt equivalent,” you will see that it is actually using only 9 watts for LEDs and 13 watts for CFLs – values much lower than its incandescent equivalent. My CFLs never last the 10 years they’re supposed to. Why is that? It could be a number of reasons. Keep in mind that the 10 year life span is rated on only using the bulbs 3 hours per day. If you use your lights much more than that, the life of the bulb in years will be shorter than what is stated on the box. The most common reason for significantly shorter bulb life is that the bulbs are not very high quality and/ or they are operating at too high of temperatures because of being partially or fully enclosed. Look for ENERGY STAR labeled bulbs, which tend to last longer and be of higher quality. Also, CFLs should not be used with dimmers unless designated as such. CFLs life span will also shorten somewhat if you turn them on and off frequently, but don’t let that stop you from turning the light off! Will LEDs really last 22 years? Only time will tell. We have learned a lot why CFL bulbs had shorter lives and the same reasons of using bulbs in fully enclosed fixtures and not being ENERGY STAR labeled are still going to be likely culprits for reduced LED bulb life. Does the mercury used in CFLs outweigh the environmental good from their use? The average CFL contains 5 mg of mercury, of which less than 1 mg is released if broken. Even considering this, because electricity generation is also a source of mercury pollution and CFLs use much less electricity, operating a CFL bulb results in a third of the total mercury pollution as powering an incandescent bulb. LED linear tube lights are an emerging energy-efficient technology. Use this guide to learn more about them. Fluorescent lighting is universal. Look up, and you’ll likely find these familiar tubes lining the ceilings of many buildings. Linear fluorescent lamps (LFLs) have largely reached their maximum energy-saving potential, and they also require recycling. LED lighting is a new alternative. LED lighting is rapidly evolving and providing an alternative to LFLs. Building owners and facility managers are adopting LED lighting for its long life span, energy efficiency, and controllability. Linear LED lamp designed to work with compatible fluorescent ballasts. Most products are designed to work with T8 and T5 electronic ballasts. Pros: Cheapest, simplest install with no fixture modification. Cons: LED lamp must be compatible with fluorescent electronic ballast. Like Type A, this tube operates with an internal driver. The difference is that lamp sockets are directly wired to line voltage and ballast is removed. Pros: Maintenance costs due to failed ballasts are eliminated. Cons: Higher install cost. Electrician, wiring, and nonshunted lamp holders required. This tube uses a remote driver. Like Type B it involves electrical modification to the existing fixture, but at low-voltage to the sockets. Pros: Best overall system compatibility. Cons: Higher install cost. Wiring and external driver required. Looking for quality? Check for the DLC mark. The DesignLights Consortium™ (DLC) is dedicated to accelerating the widespread adoption of high-performing, energy efficient commercial lighting solutions. DLC keeps up a qualified products list (QPL) that features lights meeting their performance standards. Check their list at designlights.org. Thinking about LED street lighting? Here are some resources to get started! During our February CERTConference back in 2013 several regions expressed interest in LED Street Lighting. Since that time interest has only grown and there are many local governments starting to move forward with projects – including a few CERT Seed Grant Recipients. To help ourselves better respond to questions about LED street lighting we began to sift through recent reports to tease out answers to the most common questions we were hearing. Rather than keep that to ourselves, we decided we’d be better off sharing that information with all of you. Here goes! The first question we were often asked was, “Is there funding for LED Street Lighting Retrofits?” The short answer is, maybe. The longer answer is that some utilities in Minnesota have LED Street Lighting rebates. Your best bet would be to talk directly with your local utility about what rebates they have to support this sort of retrofit. Some local units of government could also bundle a street lighting upgrade into a larger energy efficiency infrastructure improvement project through the State’s Guaranteed Energy Savings Program (or “GESP” for short). Based on the studies that have been published, and anecdotal reports, one thing to keep in mind though is the savings related information. A recent MN DOT study, described further below, pointed out that the majority of the savings from installed LEDs are really on the maintenance end (or rather, avoided maintenance) rather than energy savings. This is also what we’ve heard from cities that have started to look at their options. Now, this should still be a great selling point – saving labor is probably as important as anything else – but it does mean that looking at energy savings figures alone will not likely sell the project. Minnesota Department of Transportation (MN DOT) recently released a report on LED Street Lighting. Here is the overview and here is the full document. The report referenced the following: “Nine different LED manufacturers represented by six vendors were applied east of Hiawatha Avenue: American Electrical, Beta, Elumen, Hadco, Hanover, Holophane, Light Emitting Design, Lumec, and Sylvania. Each light manufacturer was installed in a one-to-two block area to facilitate comparison of light levels, color, and public appeal.” Page 16 describes the results by manufacturer. They actually called out Hadco as a brand that had shorter paybacks but still higher quality lighting. As a side note for Minnesota GreenStep Cities, the best practice adviser, Susan Zarling, is the technical liaison for the DOT report, so it would be worth touching base with her about specific manufacturers. The Minnesota Department of Commerce also funded an LED lighting study. The research report came out in December. It’s full of good information. Page 1 lists the manufacturers they considered (which did not include Hadco, as referenced above). Pages 6-12 detail a 10-step “how to” guide for lighting upgrades and they also provide sample inventory sheets, etc. It’s a great resource on how to move forward. You can also download a two-page factsheet with highlights from the report. The City of Chanhassen was involved in the report, too (learn more about their involvement). Xcel Energy has a LED street lighting pilot project in West St. Paul, MN. Xcel Energy is partnering with the city of West Saint Paul and GE Lighting Solutions on a two-year LED street lighting pilot project. The goal for the pilot project is to gather information to develop a LED streetlight rate and fixture option. The data they collect will allow them to better understand maintenance requirements and costs, reliability, energy consumption and light output. See speaker presentations from the League of Minnesota Cities Annual Conference in June, 2014. There were three speakers who talked about the nitty gritty details of installing LED street lighting projects in their cities in Minnesota. Check out the presentations. Download a factsheet about a recent CARD grant report on LED street lighting. Click here to download. Are you still stringing the same old incandescent decorative lights for the holidays? For many Minnesotans, the house, porch, shrubs and trees are donned with holiday lights. Depending on one’s holiday lighting enthusiasm, a home can save between $10 to $250 each holiday season by switching to LED holiday lighting. This is because, according to the Department of Energy, LED holiday lights save up to 90% of the energy used by traditional incandescent holiday lights. LEDs are also safer, sturdier, longer lasting, and easier to install. Fill your stocking with energy savings: For every old holiday lighting string recycled and replaced with more efficient LEDholiday lighting, 19 kilowatt-hours of electricity are saved over the course of the holiday season. This is the same amount of energy as a common CFL household light bulb would use if left on for 24 hours a day for 2 months straight! ENERGY STAR is the way to go: When shopping for new holiday lights, look for the ENERGY STAR® label to ensure that the product meets strict federal energy efficiency guidelines. ENERGYSTAR-qualified lighting, as well as appliances and electronics, use less energy than their older, inefficient counterparts. ENERGYSTAR-qualified LED decorative lights are an economical choice because they use 75 percent less power than conventional lights and they can last up to 10 times longer. Safe. LEDs are cool to the touch, reducing the risk of fire. Keep old lighting out of landfills by finding convenient recycling locations near you in Minnesota! To use: Simply choose a lighting material to get started (and provide your location if it is not done automatically).